The Ultiworld 2017 Women’s Club Awards are presented by VC Ultimate. All opinions are those of the authors. Thanks for supporting the brands that make Ultiworld possible! With Nationals over and the winners crowned, it is time to take a moment to recognize the top performers in the Women’s Division this season. While the talent of the division reaches far beyond short lists, the All-Club teams are meant to honor those players who put together what we believe to be the best seasons in the Women’s game this year. While we consider both regular season and postseason performance, because of the nature of the club division, we weight success in the Series and at Nationals above all else. The All-Club teams are selected based on input from Ultiworld reporters, contributors, and editors. 2017’s Molly Brown probably had the most roster depth since the team’s inception. Their injuries throughout the season proved that their players were able to step up and fill in any role that was left open. Well, any role but Claire Chastain’s. This season, Molly was Chastain’s team to run and it showed through her versatile role on the field. She was everywhere, taking positions as the initiating cutter, front-of-stack, or central handler. 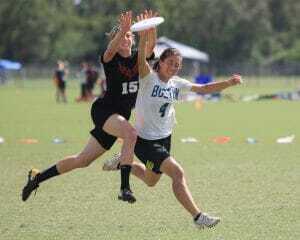 Chastain was more than just a bail-out option if the Denver offense lagged; she was the most threatening player in the Division with the disc in her hands. With a full range of throws and excellent field sense, it’s not wrong to call her the archetype of a perfect offensive handler. A season stat-line of 24/56/6 (G/A/D) illustrates that perfectly. She was the best player on a team that featured the best offense for a large portion of the season. So often we discuss how a good defender can take a great player out of the game. In the case of Chastain, she could take great defenders out of the game. On resets, she could always find a way to get open and seemed to effortlessly break the mark. Few players are so discouraging to mark. It was still necessary to place great defenders against Chastain — they just had to be content with what little they could take away. To pigeonhole Chastain as a purely offensive player would be to do her a great disservice. While primarily on the O-line, Chastain seemed to have just as many defensive highlights. Her six blocks from the season do not reflect her true defensive merit. You cannot earn a block if the offense refused to throw a disc in your vicinity. Between shutting down her athletic match-ups and orchestrating Denver’s disciplined offense, she lived up to the hype and fully deserves her spot on the 2017 All Club First Team. At this point, Kami Groom’s excellence is well documented. How many times can one discuss her being the fastest player in the division before it becomes a drab platitude? But what’s most impressive about Groom is that she’s still always exciting. Watching her blow past the most athletic players in the division never becomes dull, no matter how many times she does it. And to the surprise of no one, Groom did it a lot this season. She was the only player for Boston to post a double-double at Nationals with her 11 goals and 14 assists. And she added eight blocks for good measure. Her 21, 25, 14 line for the season puts her right up there with the best as well. It’s still baffling that she somehow was left off of the World Games team, as Groom has been one of the two best players in the division for two full seasons now. She’ll have to settle for a spot on this team and her first runner up spot for Player of the Year for now, but if her stellar 2017 performance is any indication, Groom and her elite status aren’t separating any time soon. Another year, another All-Club selection for the 27-year old star, who has steadily fashioned herself into one of the premier players on the planet. This marks Desmond’s 3rd appearance on the All-Club 1st team, with a 2nd team selection for good measure. And this time, she took a different path to the same accolade: as a standout defender. It was “Dezi’s” defense that stood out this season. Desmond’s long been a potent offensive threat, an athletic cutter with great range, excellent mechanics, and plus throwing skill that could crush in the deep lanes or facilitate underneath. But at Nationals, she was sent out as a handler defender. From that position, she swallowed up even the most elite throwers — her length, athleticism, and intelligence erased opportunities for throwers and resets alike. It wasn’t a performance that sent statisticians reaching for their pen to tick off blocks, but it frustrated offensive centerpieces and eroded offensive rhythm for opponents again and again. On offense, she again was one of the best goal scorers in the division, although her numbers don’t jump off the page. Seven goals is solid work, tying last year’s numbers and landing her at #2 on Fury in goals. However, it’s worth nothing that Desmond continued to, as she did on defense, make a significant impact on the game without doing the same to the stat sheet. In some ways, it demonstrates her continued growth as a player, and despite her star-status and wealth of talent, she’s mature enough to be comfortable operating in a system, away from the spotlight. But she’s simply so good, she’s still hard to miss. 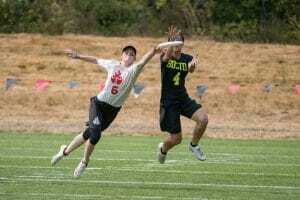 In her first year with the team, Paula Seville’s masterful disc skills helped Atlanta Ozone earn the biggest upset of the weekend over Seattle Riot and a spot at Worlds. Seville came to Atlanta after winning a title with Brute Squad in 2015, and her composure stood out in Thursday’s blustering wind. Few players’ throws looked elite, let alone pretty, during pool play. Yet Ozone kept their deep game viable with the pinpoint shots from Paula Seville. Elite defenders couldn’t pressure her to change the edge on her throws, whether she looked for a simple swing or a 60 yard bomb. The throws weren’t just powerful, and they weren’t just accurate. Each throw was like a compact, floating master class in control and consistency. Seville was one of the best throwers at the tournament, and she was one of the most prolific. Seville threw nearly a third of Atlanta’s goals during pool play, and she tied for 1st in the division for assists (17). She added artillery firepower to a team that already loved their deep game, and she made it unstoppable. Liên Hoffmann, the Defensive Player of the Year, is more than just an elite defender. Indeed, she does play a lot of her points on offense. But Hoffmann does everything exceptionally well. She’s an all around game breaker, a consistently calm wreaker of havoc. Six goals, eight assists, and 10 blocks with just six turns at Nationals. 23 goals, 17 assists, 16 blocks with just 14 turns on the season. Unrelenting efficiency. Hoffmann’s brilliance is found in the minutiae of the game: the timing of her cuts, her high completion percentage, and her ability to lock down defenders even when she’s not getting flashy layout blocks. But Hoffmann’s athleticism is also a special weapon. She’s one of the quickest players in the game and she is able to roast players for unders and quickly keep the Boston offense moving just as easily as she matches up with the opponents’ biggest threats when needed. Her execution of every detail of the game has made Hoffmann one of the top players in the women’s game for several years now, and, in 2017, she showed no signs of slipping from that peak. Boston doesn’t build its gameplan around her, but she’s as important a piece as they have, and her typically strong season was one of the biggest reasons for their success this year. 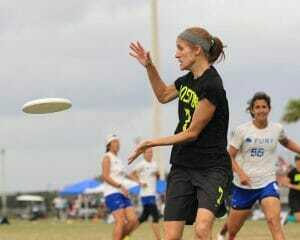 Alex Snyder turned back the clock in Sarasota to play her most impressive and dominant ultimate in years. She was the maestro of San Francisco’s offense that helped lead the team to their first title in five years. The title brings the surefire Hall of Famer’s tally to a humble eight club championships. Remarkably, her role was just as important to her team’s success as it has ever been. At Nationals, she led San Francisco in assists and finished tied for sixth most across the division with 14. It was the first time a Fury player has even been inside the top 15 in Nationals assists in at least three years. But Snyder did more than rack up assists. Snyder guided the San Francisco offense down the field at will all tournament long. In the final, she completed 42 passes and turned it just once, while no other player completed more than 29. Her backhands sliced through the Sarasota winds as if they weren’t there. Simply, she was the most impressive, least phased thrower across all three divisions at Nationals. A true veteran of the game, Snyder’s throwing prowess and tactical intelligence led her back to the pinnacle of the division this year. Perhaps it was a bit of that Sarasota magic that helped her to reach such heights. Regardless, Snyder was easily one of the seven best and most influential players of the 2017 campaign. A singular talent with virtually unmatched productivity. Takes the toughest cutter match-ups possible. The top player in the women’s division. Sarah “Surge” Griffith has been on the Ultiworld All-Club 1st Team for every year of its existence except 2015, when she was recovering from injury. Year after year, Griffith’s speed and defensive acumen make her the most versatile player on Riot and one of the most multi-talented players in the division. While Griffith is an excruciatingly fast cutter, her contributions widened this year with Riot. She posted five goals, six assists, and six blocks at the U.S. Open and 11 goals, two assists, and two blocks at the Pro Championships. In Sarasota, she posted an additional 10 goals, 2 assists, and 2 blocks, but her productivity shone in the midfield for Seattle. She took opponents’ fastest matchups, and on a turn, she ground through cuts to generate space and opportunity. A disappointing quarters exit for Riot doesn’t take away from the superb season that Griffith delivered as she returned to the elite echelon in the Division. Comments on "Ultiworld’s All-Club 2017: 1st Team (Women’s), Presented By VC Ultimate"